Eating in a grain bin sounds cold and impersonal, but, as it turns out, the Carolina Watershed is quite cozy, with a cool bomb shelter vibe. The inside has been sprayed with insulation, giving the walls a sturdy and warm concrete look. The property is composed of four grain bins. Two smaller ones make up the kitchen. The biggest, at 36 feet, is used for the main dining/bar area, and there's another small bin outside, used as a bar. Mac Hopper, an owner of the restaurant, says as a former farm boy, the idea of the bins appealed to him. He also notes using them is pretty dang cheap, too. Hopper got the restaurant bug after working on Loflin Yard. He had had his eye on the Carolina site, across from apartments he owns, for quite a while. One day a sign went up, the next day he bought it. The Carolina of Carolina Watershed is because the place in on Carolina Avenue, downtown across the street from Wayne's Candy. Watershed is a nod to the physical attributes of the property. There was once a house there, that was demolished. The site was dug out, which gave it the appearance of a watershed, according to Hopper. In addition to the grain bin bar, outside there's a couple of fire pits and waterfalls, and the yard is circled overhead by a bluff that will be closed off for private parties. Side yards offer hints of future soccer and yard games. Andy Knight, formerly of Loflin Yard, serves as chef. "Southern deli — that's what it is," says Knight. "True Southern-style cooking involves long cook times, grilling out, smoked foods." One customer came in asking for his grandma, such is the style of the food, says Knight. The menu features such true-blue sides as dilled cucumber & tomato salad, mac & cheese, black eyed peas, and buttermilk cornbread. Entrees include grilled pimento cheese with fried green tomato (! 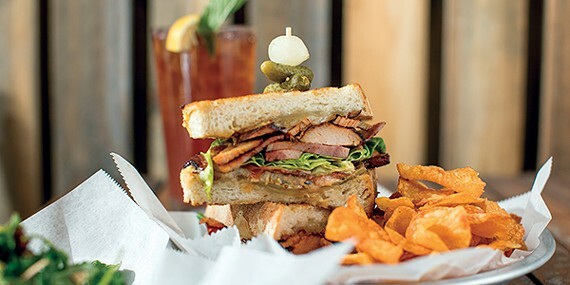 ), pork belly BLT, and a terrific-looking buttermilk chicken sandwich. They also offer, like any good place wanting to show off their Southern bona fides, a fried bologna sandwich. The restaurant has a late-night menu with a trio of burgers and loaded fries. On the cocktail menu: Jolene (Old Dominick Toddy, sweet tea, lavender lemonade), Hello Darlin (rum, lime juice, pureed corn, strawberries, hellfire bitters), and Coal Miner's Daughter (gin, lemon juice, muddled blackberries). There's also a brunch menu for Saturday and Sunday with French toast, short rib hash, steak and eggs, and, of course, a Southern sausage biscuit with gravy. 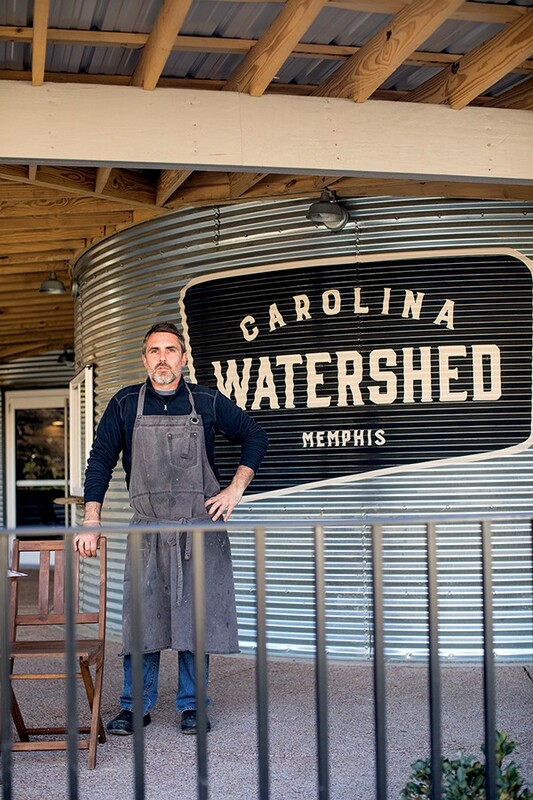 Carolina Watershed is thinking outside the cooker, so to speak. They will be offering — ready for it? — Carolina-style barbecue. Knight notes Memphis has plenty of barbecue places. "Ours is going to be different," he says. Winter hours: Monday and Tuesday 11-3 p.m.; Wednesday-Thursday, 11 a.m.-midnight; Friday, 11 a.m.-2 a.m., Saturday, 9 a.m.-3 a.m.; Sunday, 9 a.m.-5 p.m.
Jeff Watkins met JoBeth in the ninth grade. Their paths separated for 35 years, until they met up again by chance in the Atlanta airport. The Watkins have since married and pledged to find something to do together in their retirement. (Aw!) "We like spending time together," says Jeff. That thing is the Grecian Gourmet Taverna, to be located at 412 South Main. They already have a head start, selling their Grecian Gourmet dips, desserts, and take-and-bake dishes at local farmer markets and area grocery stores. Right now, work is being done on the space, which is next door to Art Village. The space is pretty — light floors, punched tin tiles on the ceiling. They plan to add a trio of coolers, an awning to cover the patio, raised seating at the window for people watching. There will be a huge chalkboard menu board and food art like paintings of eggplants and arugula. 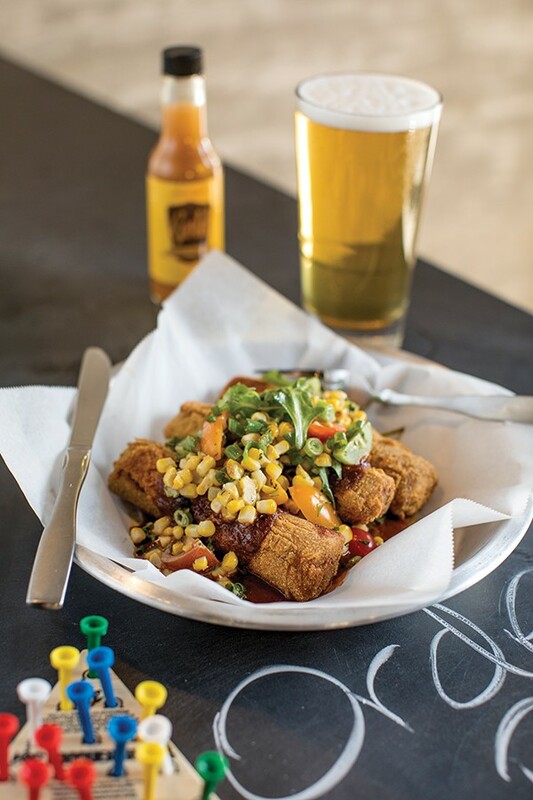 They will follow a fast-casual plan, with ordering at the counter, which includes bar orders. Jeff envisions the Grecian Gourmet as a European street cafe sort of space. He sees diners getting a carafe of wine and relaxing on the patio. The menu is JoBeth's domain. Right now, it features the classics — Spanakopita, Moussaka, Pastitso, Dolmathes, Lamb Sliders, and gyros. Sides include Tabbouleh, Greek and cucumber salads, plus there's Baklava for dessert. The coolers will contain grab-and-go items. At the beginning, they'll be open for lunch and dinner, with roughly the same menu and Sundays reserved for specials. JoBeth sees her special spatchcocked chicken, Grecian platters, and Lamb Paschou on the Sunday menu. Eventually, they'll offer breakfast with homemade Greek yogurt. The Watkins feel like they'll be filling a need for a good Greek place. "We felt we developed a niche," Jeff says. "We dreamed of having a place like this." Soft opening for Grecian Gourmet begins February 15th, with a grand opening set for March 10th. Grecian Gourmet Taverna will be open 10 a.m. to 8 p.m., Tuesday through Sunday.